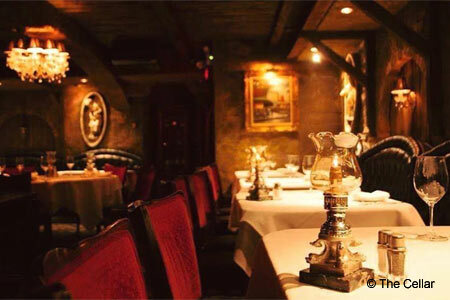 A romantic underground grotto serving a wine-paired menu with European and California flavors. : This Fullerton restaurant has been one of north OC’s most romantic destinations since 1969. Walk down a flight of narrow stairs and open a wooden door to a real cellar, elegantly decorated by one of the artists who built Disneyland’s Pirates of the Caribbean attraction. With low-hanging ceilings, The Cellar lives up to its name with three cozy rooms, black-leather banquettes, rich red carpet, bright-white Goddess statues and glowing golden candles. The menu features local, seasonal ingredients, natural meats, wild seafood and less traditional dishes like salmon tartare. Start with one of the pre-Prohibition-style cocktails or a glass of well-chosen wine. Next, select an appetizer such as the signature escargots, or begin with a salad of baby field greens, candied walnuts and blue cheese served with a fig-Champagne vinaigrette. Main course portions are quite large, and we recommend the classic Châteaubriand or the blackberry-bourbon sauce-topped pork chop served with roasted potatoes and shallot purée. For dessert, go for the chocolate or Grand Marnier soufflé. The wine cellar, which is located just above the restaurant, is a treasure trove sheltering more than 1,400 labels.